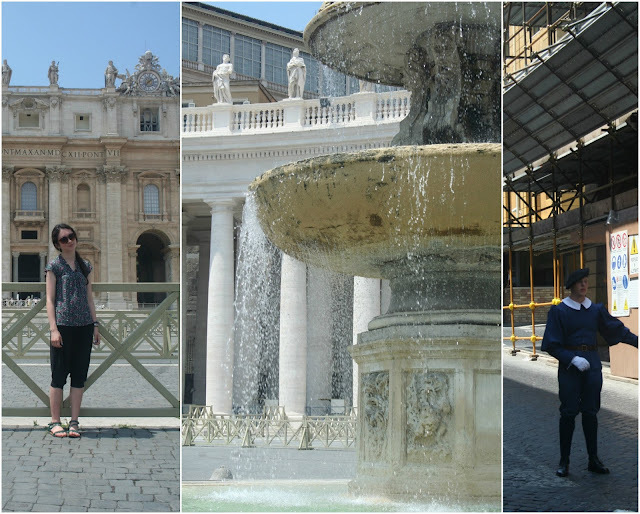 I've mentioned in previous posts that I recently visited Rome with my Mum and Grandma. I absolutely loved the experience so I feel like I have to show you what it was like. 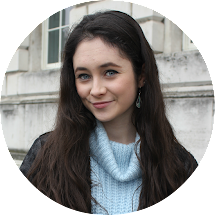 Beware - this is a long post so grab yourself a cuppa and enjoy! 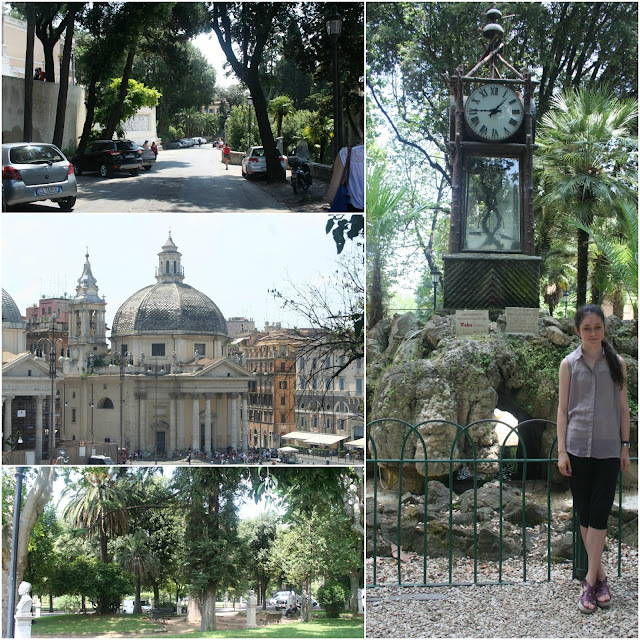 Travelling to Italy was pretty stress-free. 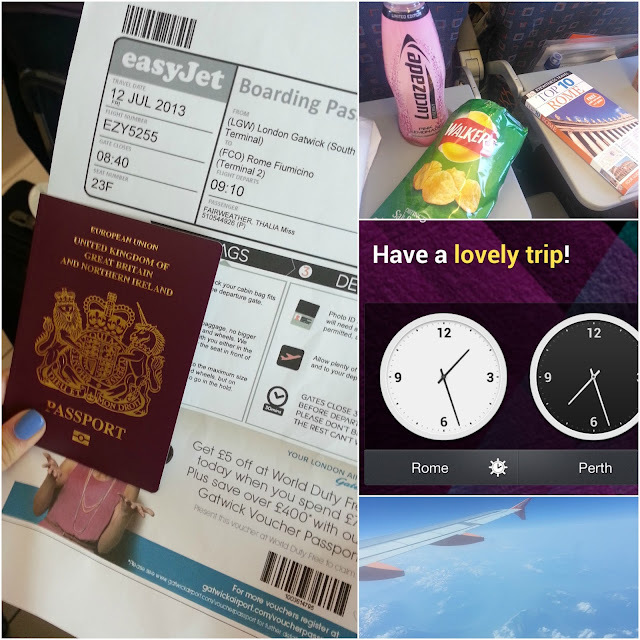 Easyjet are fab for short haul flights and although the flight attendants said the journey would take two and a half hours, but realistically it came to just short of two hours. Fabulous. I must say that I really appreciate how they've introduced assigned seating, it saves all of the chaos of rushing and whatnot. I flew with them to Majorca last year (post on it here) and the flight home was loud and disruptive as families with young children were being split up and nobody was happy. However - onto happier thoughts, the flight was great. As you can see on my boarding pass it didn't depart too early either which was great. Nobody wants to be on that first flight of the day at 6.05am. Nobody. Also, flying over the Swiss Alps was lovely to see out of the window, I've never been there and the view from above is spectacular. 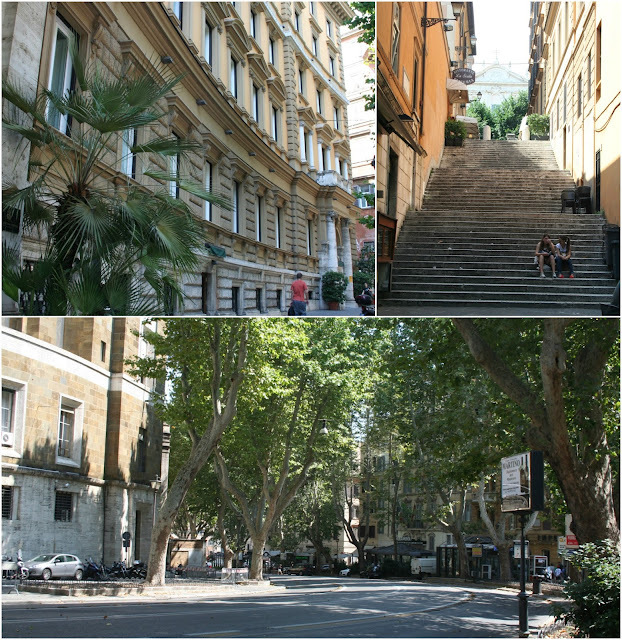 The region of Rome we stayed in is called Barberini, a convenient couple of stops on the metro line to Termini, Rome's main station. Think the King's Cross of Rome..it's the full schbang. From there you can get a shuttle bus for €4/5 to Fiumicino Airport. Super convenient. The street we stayed on is called Via Veneto and is pictured in the collage above. The roads are lovely and wide and the trees are really green at this time of the year. Everything in Rome was so grand and large architecturally, so that's something that contrasts to the variation in size that you see in London. On this road there are many cafes and bars that provide any type of need, whether it be a cooling gelato at 2pm or an evening drink. One restaurant really stood out to us and that was ELLE. The staff were super lovely and welcoming and recognised us by the time we left due to us coming back time and time again (that is what I call the strong influence of a delicious initial meal, pizza to be specific.) If you ever go to Rome I would seriously recommend giving it a visit for lunch or dinner, I would say that you could find a better (and cheaper) breakfast elsewhere but when it comes to meals from the afternoon onwards they were the best. 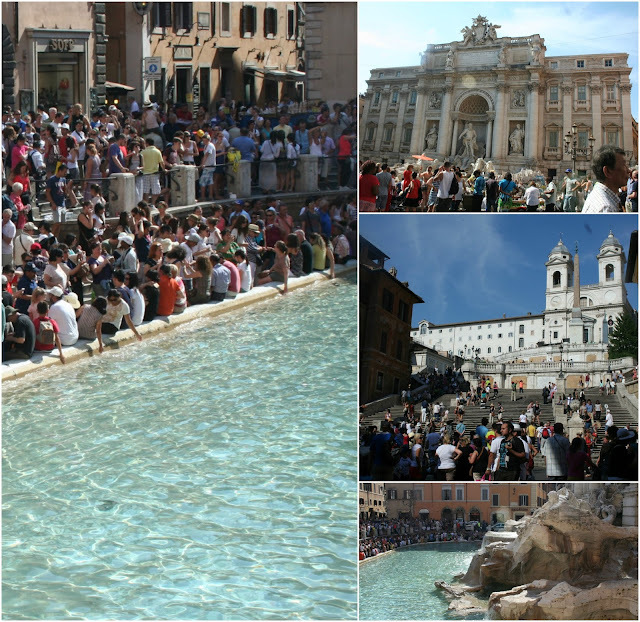 Just a ten minute walk away from Barberini metro station is the famous Trevi Fountain, with the Spanish Steps being located not that further away from the fountain. As you can see the Trevi Fountain was packed, so unfortunately we never got the chance to throw in coins and make wishes. Nonetheless, seeing it was good enough for me and on a summers day it really is extraordinary. The Spanish Steps were another recommendation from Virginia (who I must credit told me many places to visit in Rome) and they didn't disappoint either. I must admit they were 135 steps that our feet never graced merely due to laziness and the fact that by this point we were hungry. As we all know, my priorities never place exercise over food. Ever. The historical sights are a definite go-to if you visit and wonderful touristy photo opportunities. They're more of a visit-for-fifteen-minutes-and-go sort of thing than a long visit, those places will be mentioned later in the post! Other than being a spelling that my brain will probably never work its way around, the Colosseum, as I am sure you have heard of is a breathtaking Roman piece of architecture. I won't go into a historical tour guide tone (save that for if you visit, those guys actually know what they're talking about), so in basic terms it is simply the ruins of the largest ampitheatre in the world (cheers, Google). It is mind-stonkingly huge, and does take a while to walk around, photograph, visit the exhibition and truly experience it. It's definitely on the day trip scale. Anyway, at first I was slightly apprehensive before visiting it as I understood its importance and all, however I was cautious as to how interesting it would be. As much as I would love to explain how cultural visits have the ability to engage me for hours on end; but usually they don't, anyhow this was undoubtedly an exception. I took so many photos whilst there, around 300...many of which came out quite well. My lens was not capable of portraying quite how huge the place is, and how when you're visiting it you feel like the smallest insect; crawling, completely overwhelmed by the sheer size of the concrete and stone establishment. Many statues and representations of important Roman figures are shown in the exhibition, hosted on the second tier and in shade, covered by the ceiling of the third tier. This made it refreshingly cool, so you could take time to read the stories and link it to the corresponding artworks. I would suggest going there if you're intrigued by different cultures, or if you're the keen tourist. If you're more of a relaxing, chilling type this may not be for you. A lot of walking is involved so wear comfy shoes! Please, I am begging you. 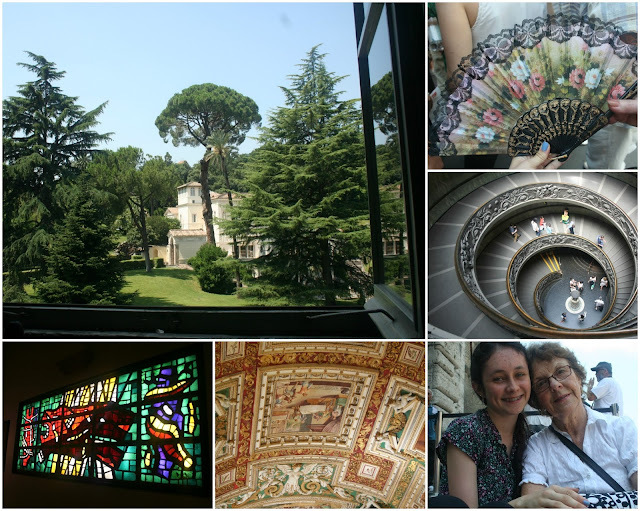 Villa Borghese was another fabulous suggestion from Virginia and a place that I simply could not summarise in only one collage. I'm not completely sure on this but I think it is the largest open garden in Rome, and has a wonderful panoramic view of the city from one of its highest points. Now, it is a climb and a half to reach the top but it is so worth it. The blazing, Italian heat is soothed by the shade of the trees as you reach the top, and from there on the ultimate relaxation can take place. Alternatively, if you're there for some fun and you have a true when-in-Rome mindset, you could try a go on a segway. 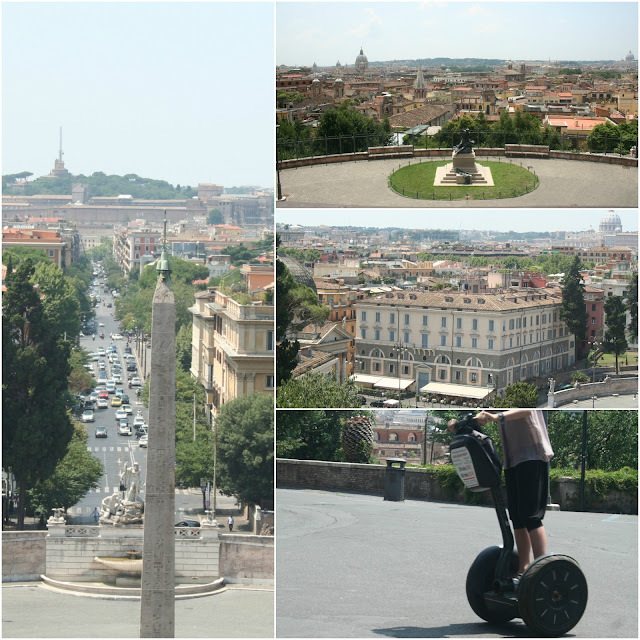 It costs around €10 for half an hour or €15 for an hour, which although is on the expensive side, it's not everyday you ride on a segway. I must admit they are harder to use than they look, far more confusing than I had anticipated but once you get the hang of it they are very entertaining. Strange views from Italians and fellow tourists were completely expected, so paying extra attention was necessary in order to keep my dignity in place. My thoughts at the time were along the lines of 'I don't want to be the person in the news story 'British girl dies in Italy after falling off a segway' that could potentially headline The Daily Mail'. Now, that would be embarrassing. Getting the jist of it took some time but once I understood the fundamentals of balancing my body weight in a range of positions in regards to the panel where I was standing, I was alright. I did not run over anybody. That in itself I am proud of. Visiting the Vatican City was undeniably one of the highlights of the Rome trip. Being able to say you've visited the smallest country in the world is just...awesome. Despite it being so tiny, so much is going on there but the Museum I would say is unmissable. One tip though: PURCHASE TICKETS ONLINE BEFORE GOING. I could not stress that enough. We paid €12 extra to not have to wait in the queue, one that was around a kilometre long and had people waiting for up to five hours. The museum is in a square shape with a large quad in the centre, so involves lots of walking to navigate the entire building. However, the walking didn't feel strenuous as I was distracted the entire time by the beautiful artistry covering the walls, ceilings, doors and entrances. I cannot even contemplate the time and skill that would have gone into completing the decor to such a high standard. Time like that merely frazzles my brain. One disappointment is that due to the lighting, it is virtually impossible to capture a photo without flash that is in focus. Virtually impossible. The two shown in the first of the three collages were two of a small bunch out of a grand total of 659 photos I took that day, Let's just say I had to resort to taking six consecutive photos in hope that the third or fourth one would be somewhat decent. 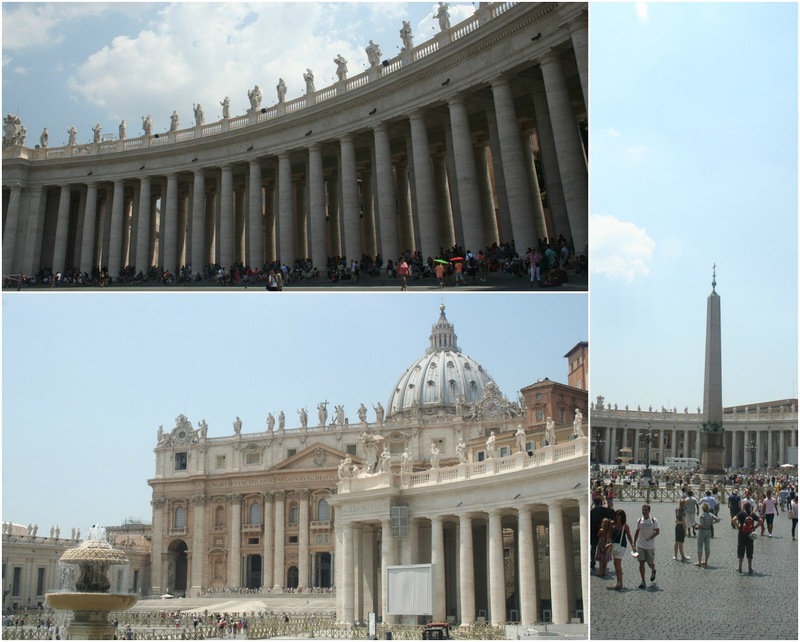 Anyhow, the Vatican City was a great day out and I would recommend it to anybody, regardless of your religion. As the views portrayed there can come across quite extreme to some, I found trying to block out the aspect of religion quite beneficial. It sounds silly considering it is one of the most important and well-known religious hubs on the planet, but the views can...irritate some. I am someone that really isn't into the prospect of religion in itself, not someone who opposes/follows one religion in particular. This may or may not be the most exciting part of the blog post for you. If it is, chances are we could be friends as essentially we are very similar. No, I'm kidding...we all love a slice of culture but to soothe the pain of walking-filled days with retail therapy is always a good idea. On the Sunday we visited Mercantino Flaminio, a market that was recommended in the July issue of Company magazine. Think many racks of vintage clothes, tables filled with jewellery and many parasols with the overheated tourists sitting underneath, trying to deal with the heat. Yes, that was us at one point. 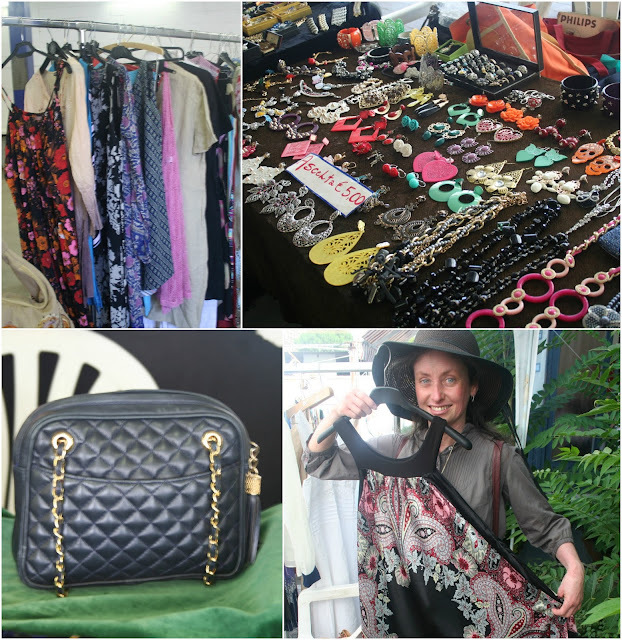 I thought it was a nice market however the prices were on the expensive side and in general I found Italian clothing to be too out-there for me. They embrace colours and prints happily whereas I'm quite the opposite, shying away from the loud and 'unmissable' items. However, my Mum left with a gorgeous pair of heels and my Grandma departed with a cute beaded belt. It wasn't half bad! I found the Sunday morning to be strange as Rome was so quiet due to the vast majority of people being in church at that time. In addition to the market, there was a Brandy Melville store on Via Cola di Rienzo which was amazing! The very chilled American style clothing is quite exclusive in terms of locations, I think there's only ten or so in the world. However, it is worth going into if you ever see one. All of the clothing is in one size, one that is slightly too big for my petite frame so I happily left with two pairs of earrings. For any Londoners that are interested, we're lucky to have the only British store located on King's Road in Chelsea. Yipeeee! If there's not one nearby where you live, you can still spend a considerable amount of time browsing their website which can be found here. I have this thing for public transport. I know so many people that hate it but I really get along with it. As I discussed with an American couple whilst in Rome, living in London seriously helps you become accustomed to underground train systems. As the London Underground is so big, everything seemed small in comparison. When I realised there were only two main lines I was in shock for a little while. I felt the same in Buenos Aires, Singapore and Paris though. It's a nice feeling. 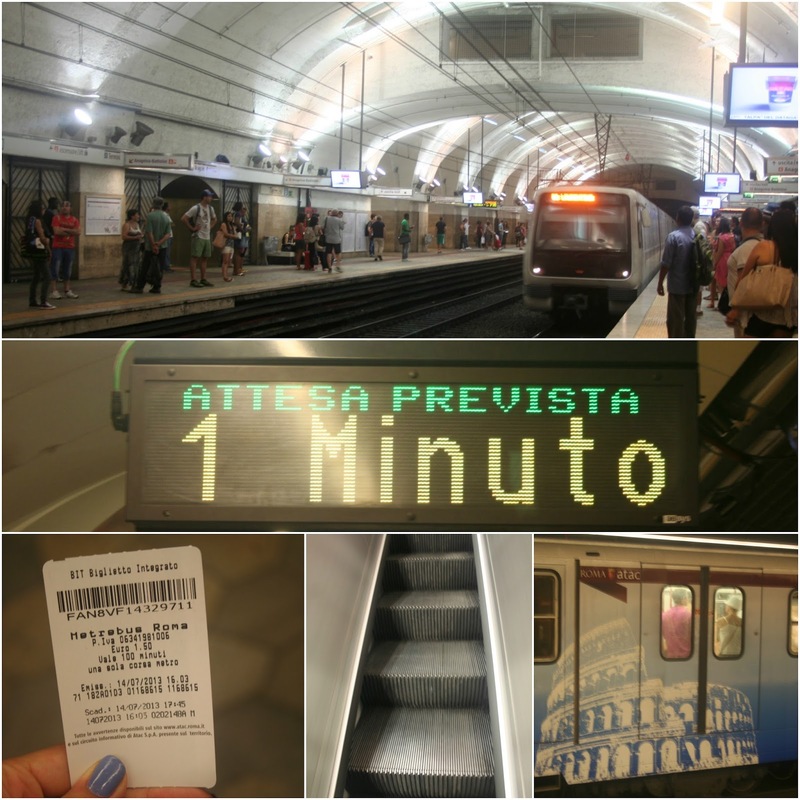 Anyway, I loved the metro. The prices are so damn reasonable in comparison to London..only €1.50 for a single journey or €6 for a day ticket. Phwoar! Makes me even more annoyed that I once had to spend FOUR POUNDS getting a child single from Oxford Circus to Waterloo. There weren't even any interchanges! London inflation struggles aside, I loved how easy the metro was to use, pay for and navigate around. I much preferred it to using taxis. I would say that I would only use a taxi if I really had to, as a complete last resort. My Mum had money stolen off her twice as the 5 and 20 Euro notes look awfully similar, so taxi drivers took pleasure in swapping them quickly, thus stealing €15 from my Mum. Cheers! If you ever go to Rome, go in a taxi when you're with someone else and make sure they watch the driver carefully as you hand over money. I'm not saying that all drivers are like this at all, just in my experience that occurred and I thought it was definitely worth warning you. I'm not going to lie, the food was the thing I was most excited about when I found out I was going to visit Italy. 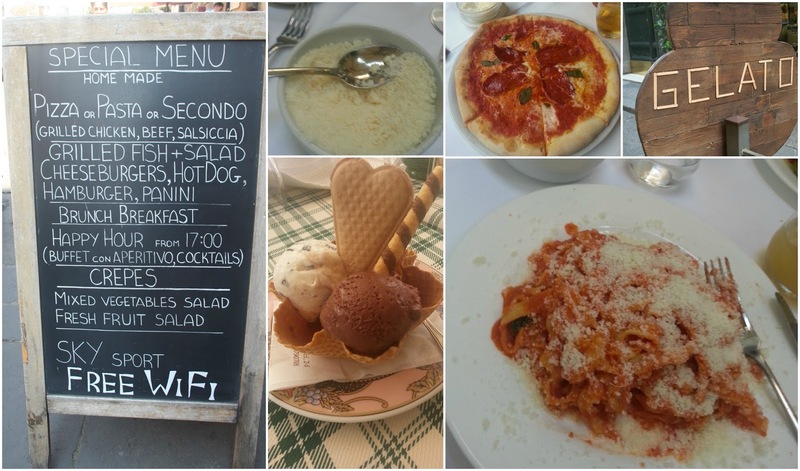 I love Italian food, it is my absolute favourite and I worked on an alternating schedule. I would have breakfast, then pizza for lunch and a pasta dish for dinner. Then the lunch and dinner variations would swap. That way things would stay interesting and I would get equal doses of two godly dishes. There was an exception when I once had pizza for breakfast... That aside, the food is fanbloodytastic. Like super good. I asked the guys at ELLE that I mentioned earlier for extra parmesan (as I fluttered my eyelids kindly and impersonated an innocent little flower) and they gave me a whole dish of it. I was the happiest human being on the planet when they handed it to me. By this point, I had unintentionally attracted attention from nearby tables and I heard giggles from other people nearby. However, this did not phase me as parmesan is the key to life and joy, obviously. I did have one bad experience with breakfast, I tried a croissant that I quote had jam that 'tastes like lip balm'. Literally. Pure coloured sugar. Many of the places offer Continental breakfasts, usually consisting of heated bread toast, a croissant, orange juice and a cappuccino. They're usually around the 10-12 Euro range which wasn't too bad. So that is all! 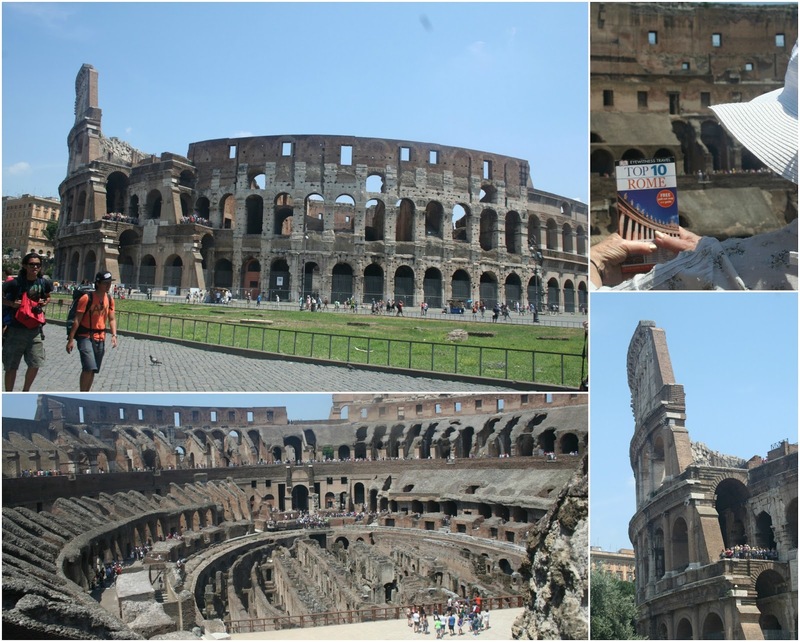 I hope that in the post that took seriosuly long to type you've seen my experience of Rome, enjoyed reading it and perhaps even added a visit to Rome on your bucket list. It's a must for any culture-seekers or food enthusiasts. Admittedly, I would say that I fall in the second category more. I also hope I haven't bored you to tears - I don't see myself writing a post this long in the near future! P.S: I mentioned Virginia in this post, a lovely lady who has a wonderful blog that you can find here. Please go and check it out if you want to read endless adventures of a polyglot who has done enviable amounts of travelling. Serious case of wanderlust? Check. Ah I would 100% recommend you go. You can say it would be simply to 'practice your Italian' (i.e find cute European boys and scoff down one too many extra large pizzas)..As they say, when in Rome one does crazy things!